ROCKVILLE, Md., Oct. 18, 2018 /PRNewswire/ -- Choice Hotels International, Inc. (NYSE: CHH) and an affiliate of True North Studio, LLC announced construction has begun on the new Cambria hotel in downtown Phoenix in the Roosevelt Row Arts District. Slated to open ahead of schedule in late 2019, the seven-story, 127-room hotel will be the third Cambria property to enter the growing Phoenix area, joining the Cambria Hotel Phoenix Chandler-Fashion Center and Cambria Hotel North Scottsdale Desert Ridge. Situated within a blossoming arts and culture borough in the heart of the city, the hotel offers guests convenient access to the Sky Harbor International Airport, Phoenix Convention Center, the professional sports stadiums of MLB's Arizona Diamondbacks and NBA's Phoenix Suns, Arizona State University, University of Arizona College of Medicine – Phoenix, and the Phoenix Biomedical Campus, as well as nearby art studios, galleries, museums, breweries, and restaurants. The hotel's location is also within driving distance to several area businesses, including Apple Data Center, Honeywell Aerospace, the Mayo Clinic, and Choice Hotels' technology and digital commerce campus. "As one of the largest and fastest-growing cities in the country, anchored by rising tourism, a rich corporate presence, and thriving arts scene, Phoenix is the perfect destination to welcome several Cambria hotels," said Janis Cannon, senior vice president, upscale brands, Choice Hotels. "Cambria hotels are designed to reflect the neighborhoods in which they are located and the Roosevelt Row location is no exception—guests can expect it to capture the spirit of the community and inspire them to explore, engage, and discover all Phoenix has to offer." "The Roosevelt Row Arts District, one of the top arts districts in the nation, is a true jewel of Phoenix. We're honored to work with Choice Hotels on this exciting project and look forward to introducing a product that truly mirrors the vibrant essence of the neighborhood. Guests and locals will love visiting the new Cambria hotel in downtown Phoenix," said Jonathon Vento, principal developer, True North Studio, LLC. The Cambria® Hotels brand is designed for the modern traveler, offering guests a distinct experience with simple, guilt-free indulgences allowing them to treat themselves while on the road. Properties feature compelling design inspired by the location, spacious and comfortable rooms, flexible meeting space, and local freshly prepared food and craft beer. Cambria Hotels is rapidly expanding in major U.S. cities, with hotels open in Chicago, New York City, Pittsburgh, Washington, D.C., and Los Angeles. There are nearly 40 Cambria properties open across the United States, and over 100 hotels open or in the pipeline in the U.S. and Canada. To learn more, visit https://www.choicehotels.com/cambria. True North Studio is a real estate development company based in the monOrchid, a landmark arts and mixed-use building in the heart of the Roosevelt Row Arts District in downtown Phoenix, Arizona. 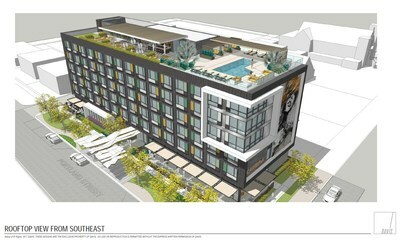 The Cambria hotel is one component of True North Studio's mixed use developments between Central Avenue to 3rd Street, and Roosevelt to Moreland Streets at Hance Park. Projects within the development include hotels, restaurants, art galleries, creative office, and commercial retail as part of historically preserved and adaptively reused properties, as well as the infill of vacant lots. These projects will contribute to the fabric of the diverse Roosevelt Row Arts District and amplify the revitalization of downtown Phoenix.